Retired Justice Javed Iqbal, head of the missing persons commission, confirmed Shahzadi’s return while speaking to BBC Urdu. She was recovered on Wednesday night from near the Pak-Afghan border, Iqbal said. Shahzadi’s family has yet to issue a statement. 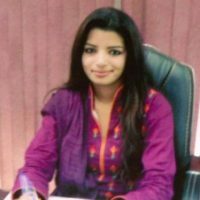 Shahzadi, who raised her voice for disappearance of victims, went missing in August 2015 while on the trail of an Indian citizen Hamid Ansari reported to have been caught by Pakistani agencies. She had filed an application with the Supreme Court’s Human Rights Cell on behalf of Fauzia Ansari, Hamid’s mother. Human rights activist Hina Jillani, in a 2016 interview with BBC Urdu, alleged that Shahzadi had once told her family that she had been “forcibly taken away by security agencies”, detained for four hours and questioned about Hamid.